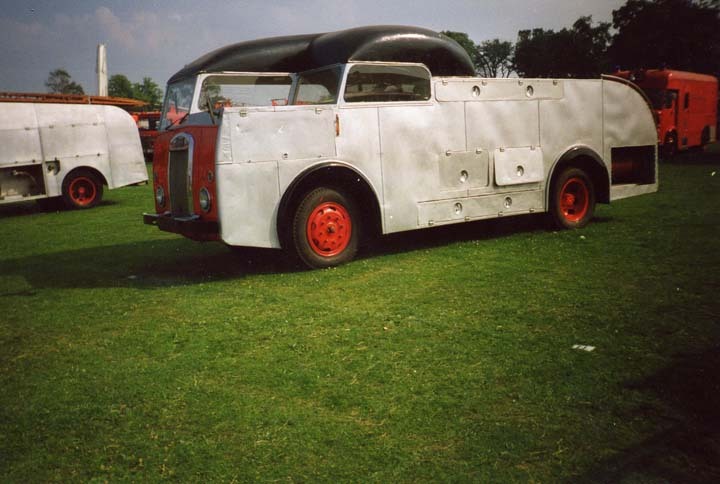 This very unusual Dennis appliance was photographed at the Teeside Fire Engine Rally a number of years ago. I can't remember the details but I think it was made to get under a low railway bridge in the Middlesborugh / Teeside area ? It had a full pump and carried a 40 foot ladder down a long locker on the near side, that's why there is no doors on that side. I think it was owned when photographed by a transport company from that area ? This machine, FXG 300, was indeed supplied to Middlesbrough and was originally constructed without a roof (the fibre flass one was a later addition) in order to get beneath particularly low bridges in the docks area. It is plated as an F12, though having a 400 gallon tank makes for the incorrect belief which existed for a long time that it was an F13. In point of fact, Dennis documentation even shows it as an F12, despite the fact that a full-size tank is far in excess of the F12 specification. Added by Ian Moore on 05 January 2008. That's one incredible looking machine! The ingenuity and craftsmanship applied during that period for me makes it one of the most interesting times of appliance design. Would be fantastic to see some more (especially in service) pictures. 1. Was the roof an addition after operational service as if not, where were the audible and visual warnings located & where did the OIC sit? 2. Why it was chosen to fabricate a roof quite like that, when something more traditional would (even retrosepctively) surely have been easier to create. Thanks for the great photo Paul. Added by John Draysey on 08 January 2008. The Franncis siren was on the shelf next to the drivers cab and originally there was a set of blinker lights there. The blue light was on top of the roof woth a quick release connection for when the roof was removed to enable the engine to go under the low bridges at Middlesbrough docks. The oic sat in the back with the rest of the crew. The machine was originally designed to be roofless. Some years after delivery the roof was added to afford protection to the crew. The idea then was that on a call to the dosck the roof was removed, put on the side of the road with a fireman dropped off to guard it and then the machine carried on to the fire. The appliance was sold to Hills DOor Makers, Stockton as a works appliance and is currently stored at Preston Park Museum, Stockton. Added by Ron Henderson on 10 January 2008. Thanks for that information, very interesting. I took the photo a number of years ago but did'nt get any info on it then. I would love to see this appliance on some of the vehicle rallies. Added by Paul Warnock on 10 January 2008. Great to see the old girl is still alive.....I used to ride it when I served with Teesside Fire Brigade in the late 1960s...everything said on the posts are spot on...the oic sat just behind the driver and had a switch for the siren. The roof was painted red and had a blue rotating light on the top with a plug to disconnect it when the roof was removed. Added by Bazza on 19 July 2008. What a unique Fire Engine. In original configuration, as an open-topped Dennis; with a Double-Decker Bus Driver's Cab married in - it has pretty good lines. Glad to see that it is still with us. Added by Pat Rivers-Bowerman on 13 September 2008. Added by Ian Mcpherson on 04 May 2009. Thats great...what sort of condition is it in ? Added by Barrie Green on 04 May 2009. Hi I paid a brief visit here also and saw this. It is pretty much in the same condition as it was at Preston Park Museum. It appears to have a fuel pump/injector problem as they were trying to start it this week, and they couldn't get it going. Added by Chris Hall Teesside. on 04 May 2009. Added by Ian Rutter on 14 December 2014.